and I’ll tell you a story of that. 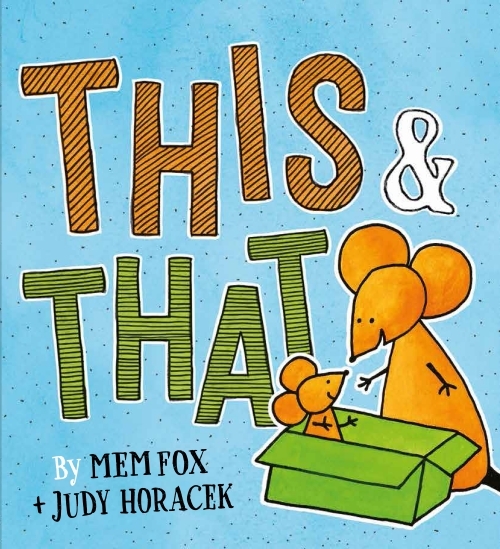 Two mice (adult and child) begin story time with an empty box, which transforms to a boat and launches their journey through imaginary worlds of the stories the adult promises. Down rivers and across oceans, through market places and palaces, with a cast including elephants, monkeys , kings and queens and so much more, the pair travel until it’s bedtime, and the adult leads the child home, finishing the final story with a kiss goodnight. Horacek’s illustrations balance lots of details on some pages, with deceptive simplicity on others, and the fact that the mice have no apparent gender is a nice touch. Matilda Mouse lives alone deep in the forest. She doesn’t have much, but one thing she desperately wants is a Christmas tree. On Christmas Eve she goes out searching for a perfect tree – but instead she finds Santa’s sleigh, caught in some vines. She may be small, but Matilda proves that she is both clever and strong, as she chews her way through the vines and frees the sleigh. Then, on Christmas morning, she wakes to find an exciting surprise – Santa has left her a tree and plenty of presents. Matilda Saves Santa Claus is a gently exciting Christmas tale which will appeal to youngsters around the world. Matilda is brave and resourceful, and her willingness to help is duly rewarded. The story is brought to life in delightful water colour and ink illustrations, with the double page spread showing Rudolph nose to nose with little Matilda especially sweet. Suitable for pre school aged readers, this would make a lovely Christmas gift. My Mum and I lived in a cottage about half an hour outside town. It hasn’t been easy finding a home that met all our requirements: in the country, no neighbours, three bedrooms, front and back gardens; a property that was old (it had to have character) but at the same time had all the mod cons – a modern central-heating system was essential, as we both hated to be cold. It had to be quiet. It had to be private. We were mice, after all. We weren’t looking for a home. We were looking for a place to hide. Shelley is nearly sixteen, and home-schooled by tutors paid for by the education system that failed her. She and her mum have fled the city to live in an isolated English country cottage to escape horrific bullying. Surely now they can relax in the safety of their new home. But the isolation of their cottage proves both a blessing and a burden. When they encounter an intruder, Shelley’s response is spontaneous and has far-reaching consequences. She has had enough of being a mouse. But nothing in her past could prepare Shelley for what happens next. She and her mother are unalterably changed by this random encounter. ‘Mice’ tells Shelley’s story in first person, so it’s not always clear how flawed her perceptions are of what’s happening around her. But the reader can feel her confusion, fear and shame, and quickly empathises with her and her mother. Mice doesn’t draw a pretty picture of the confident, the ‘successful’ characters. They are cruel and manipulative, secretive and vindictive, all the while managing to convince most of their peers that they are innocent of any wrong-doing. Mice shows how easily bullies can escape the consequences of their actions. ‘Mice’ is a gripping novel that will have readers holding their breath as they turn each page. Recommended for mature middle- and upper-secondary readers. Available in good bookstores or Mice. The rhyme and rhythm of this picture book is perfect for the story of four mice who are tired but suddenly become very active , skittering and scampering around when Mum and Dad say it’s time for bed. This is a gentle tale that will delight young children and provide a satisfactory ending to a day. It is a story filled with warmth and family love. The illustrations are cute. Although they are not overly imbued with colour most of the time, they are warm and suit the gentle text. The faces of the mice are very expressive. I particularly liked the bath Time illustrations and those of the scampering, scrambling scurrying fun. I loved the books on the bookshelf and the mice being read a bedtime book. Even the end papers are a delight to pore over with the little mice in various activities. This is sure to become a book young children and parents will be happy to read again and again. Available in good bookstores or online from Fishpond. Ben the post-mouse spends his days delivering letters to every house in Mouseville. He loves his job, and the people of Mouseville love him – but nobody ever writes to Ben. Ben has a great plan to make sure he gets some letters – he advertises for a Pen Pal. But soon he has more letters coming in than he can handle. Can his Squeak Street friends help him to sort out his problem? Ben the Post Mouse is part of the Squeak Street series, each focussing on the story of one resident of Squeak Street. Young readers will enjoy the humour of a the situation here – a postman who never gets letters of his own – and will also appreciate the acceptability of the story, which is designed to be read alone by beginning readers making the transition to first chapter books..
Ben the Post-Mouse is a cute offering.